the first cow. a second cow is 9 feet behind and a foot to the right of the cow. it is facing left. a marble cow is 5 feet behind and a foot to the left of the first cow. it is facing southwest. 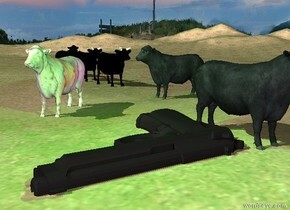 three black cows are 20 feet behind the second cow. the ground is grass. 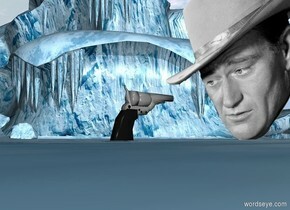 the enormous iron gray gun is 3 feet in front of the marble cow. it is facing left. it is leaning 90 degrees to the left. it is 5 inches in the ground. the green light is 4 feet above the gun. the blue light is 2 feet to the right of the red light.